Canadiandollarbingo CA$H and Car Contest! Join us June 1st - August 31st for the largest contest in TheBingoAffiliates history. Put the petal to the metal and race on for over $350,000 in GUARANTEED contest games. Plus! one lucky member will take home our Grand Prize of $10,000 CASH or a three-year lease on a 2017 Chevy Cruze LS this September 2017. How to participate? 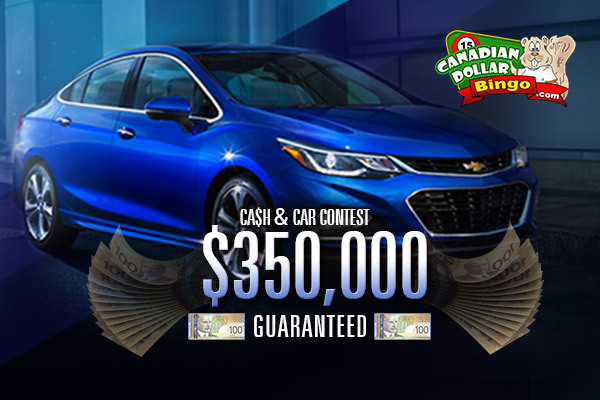 The CA$H and Car Give Contest will run on all three of our networks (AmigoBingo.com, CanadianDollarBingo.com, and BingoAustralia.com) between June 1st and August 31st, 2017. Every hour we will play our SPECIAL “CASH or CAR” pattern. Every time you win this pattern you will get 1 Grand Prize entry automatically. Pre-Buys will be allowed for this special contest pattern for the duration of the contest. Winnings across all networks will be allowed and totaled towards the grand prize. CanadianDollarBingo is part of the well-established TheBingoAffiliates network and the only bingo site for Canadian bingo players that pays and plays in Canadian dollars. This entry was posted in Blog on Aug 12, 2017 by Canadian Dollar Bingo.